Hir at Steppenwolf Theatre. Photo by Michael Brosilow. Who said theater was dead in the summer? Chicago’s theaters, storefront, midsize and large, have active summer seasons. These are some of the plays I’ve seen and reviewed in the last few weeks. They’re all still running, so you have time to see something wonderful. 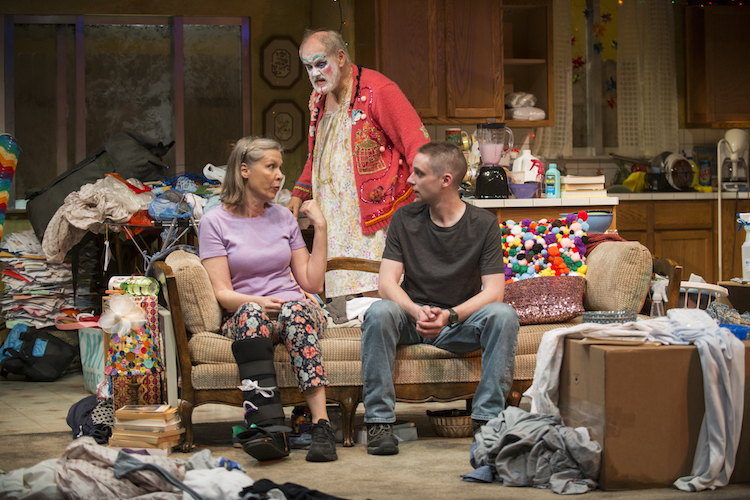 Taylor Mac’s script for Hir (pronounced “here”) is brilliant, wordy and fast-moving. It’s a startling play, as I said in my headline, because the publicity makes you think it’s all about sexuality and gender identity. But it’s about much more than that. Terrific acting and a set that will make you happy to go home to your relatively neat living room. Director Hallie Gordon has some of Chicago’s finest actors to work with and she takes full advantage of their talent in the pacing and mood of this play. Runs through 8/20; running time 2 hours. Megastasis‘ title is odd and never really explained well in the script, but ignore that, because this play is terrific, terrifying and informative. Yes, really informative. 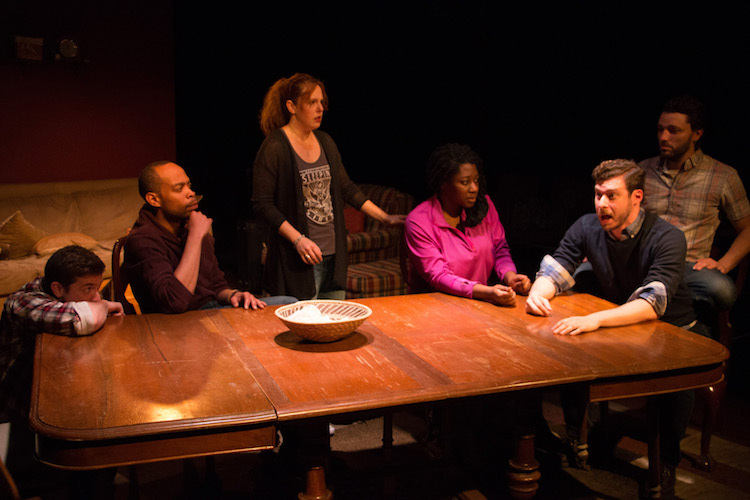 The playwright takes the time to have characters explain what’s happening to young black men because of mandatory minimum sentencing, changes in drug laws, asset forfeiture, and parole restrictions. The story is about Tray, a young man trying hard to make a life for himself and his baby daughter, while living with his grandfather. A couple of small mistakes (like buying a few joints) get him in trouble that results in a long prison term. It’s a wonderful and disturbing human story. My review. Runs through 8/20; running time 2 hours, one intermission. Lela is a woman disrupted and betrayed by the men in her life. It’s an unsettling and searing performance by Cruz Gonzalez-Cadel, in a play that the playwright calls a monologue. But the men keep appearing to interrupt her and change the course of her difficult life in an eastern European war zone. Read my review and see this show before it closes on 8/19; running time is 100 minutes, no intermission. My review of At the Table mentions that it might remind you superficially of The Big Chill, but the conversation goes much deeper than that 1983 film. Act one is chatty, sometimes contentious, as we get acquainted with the diverse group of friends. Then, “scene two of act one breaks the play open. Perlman’s smart writing has lulled us into thinking we are seeing a contemporary comedy of manners, set in a rustic weekend house … while lurking in the bushes are today’s racial and identity collisions.” You can see At the Table–and you should see it–through 8/26. Running time is 2.5 hours with one intermission. This is a terrific one-man show where Erik Jensen takes on the persona of iconic rock music critic Lester Bangs and invites us into his messy, drug- and cough-syrup ridden musical nightmare life. I reviewed this with one of my colleagues and we had fun with it. Jensen and his wife, Jessica Blank, are co-playwrights in this adaptation; she’s the director. They are a formidable pair. Runs only through Saturday 7/29; running time 90 minutes. There’s a lot of silly burlesque comedy plus bubbly dancing girls in The Nance, but there’s substance too, as my review notes. The story is about a middle-aged gay man who performs “the nance act” at a 1930s New York burlesque theater at a time when the same activity in real life would put him in jail for illegal homosexual activity. It’s a time of change in burlesque theater and the playwright doesn’t hesitate to tell us about the actions of Mayor Fiorello La Guardia and his licensing commissioner–and the response of the theater community. Runs through August 13; running time 2.5 hours.